If you’ve never invested in an RC boat before, Cyber Monday & Black Friday are the best times of the year to do so! Everything is on sale right now, there are a ton of deals to choose from, the coupons are live, and you can easily save up to 50% on select items, but only if you’re fast enough. Amazon has a couple of limited sales that are going to be gone as soon as they are all claimed and snatched up, so make sure you get a chance to get your hand’s on one before they’re all gone. The GordVE High Speed RC Boat by TOYEN is currently priced at only $49.99. It comes with a coupon that takes $4.00 off the total price when you apply it before you check out, so make sure you remember to click it in order to get this great deal. The GordVE RC High Speed RC Boat by TOYEN only weighs 10.6 ounces, which helps to gain impressive speed at a quick rate. The H102 Velocity RC Boat by Force1 was initially priced at $69.99 but is now priced at $55.99 for Black Friday & Cyber Monday. You need to act fast, however, as this deal is limited time only. At this time of writing, the deal is 79% claimed, so make sure you get the sale price while you still can! The H102 Velocity RC Boat by Force1 cannot be used in saltwater, only in freshwater pools and lakes, so keep that in mind when it arrives and you take it out for the first time. 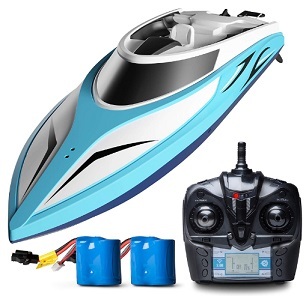 The High Speed RC Boat by SGOTA is currently priced at only $61.99. There is a coupon available for 10% off, so make sure you click it and apply it to your cart before you make your purchase. The High Speed RC Boat by SGOTA is an impressive RC boat that’s a perfect investment to make during Black Friday & Cyber Monday. 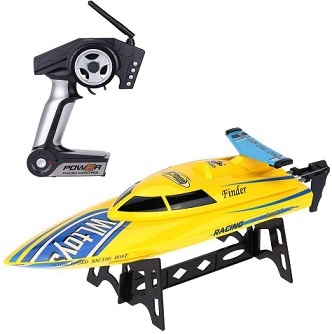 This is a great RC boat for kids or adults and you can’t go wrong with a deal like this one!